Bask in the averageness. Bask in it. I drive a 2005 Pontiac Grand Prix. Waiting for the punch line? That’s the punch line. I drive the most-average car in America. It’s like eating a Louis Rich cold-cut turkey sandwich for lunch. With no condiments. It’s like eating bran flakes. Or drinking tap water. Room-temperature tap water. 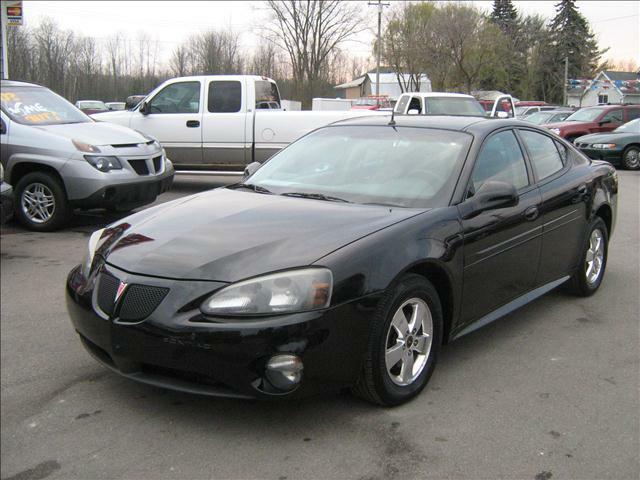 Driving an eight-year-old Pontiac Grand Prix is, on a scale of 1-10, a 5. So, here’s the deal: I’m 34. I’m single. I need to attract a mate. And I’m constantly embarrassed at the idea of meeting someone out or picking them up in my Pontiac. In fact, as I type, I’m planning to meet someone out for drinks tomorrow. What will she think of my car? I have a thing for Grand Cherokees and Jeep Wrangler Unlimiteds. And I dig on the Cadillac CTS as well. Those are the vehicles on my very short list. I’m often heard these days using the line: “I could DEFINITELY get a girlfriend with one of those,” referring to some amazing car I happen upon. I could totally get a girl in a fly Caddy. Then it hit me: Do I really want the kind of girl in my life that’s going to evaluate my worth based on my car? So, now the Pontiac has purpose. It’s more than just a car to get me from Point A to Point B at a totally average pace. It’s the Girlfriend Litmus Test. If I roll up in my Pontiac, and she’s still like: “Ohhhh Matt, you’re the best ever,” then I know I have a keeper. Forgive my multiple comments today, I’m totally wrapped up in your story. Note to self: No yellow cars. I know you don’t have this car anymore (since I’m backreading your blog in a totally random order) but at least you don’t (didn’t) drive a minivan. Try showing up for a date in one of those. Nothing screams Soccer Mom (an image I try hard not to project) like an eight year old minivan. I’m seriously considering getting another car to drive for when I do start dating. Of course that would require money….which I have none of. LMAO…Ok, so like nights7 said, I too know you don’t have this car anymore because I have been following you for a few months and today I have decided to start from the beginning of your blog and read them all now…this will take some time as you have been blogging for 9 months :) but I will enjoy ever one of them…lol Personally, I could care less if a man showed up on a bicycle to “take” me out on a date,obviously I’m not 6 and can’t sit on the handle bars and we would end up taking my car. Material things don’t make up who you are and the person they are dating or potentially falling in love with. And shoot, as far as mini vans go, I was dating a guy who drives one (his wife passed away which is why he was single), those things are freakin nice! LOL anyways…material things shouldn’t make somebody like or dislike you is the point! So, totally late for the bus but your blog post reminded me of the movie “Swingers.” and the party in “the hills” with all the women judging the guys. If you have not seen it is a must! Is it still common in the US to pick up a girl/lady at home for a date? Here in Germany, the rule for online dating is not to tell the adress to a stranger. Hi Joachim! It’s two years later, but I thought, why not reply. I don’t live in the US; am British (but did spend 6 years in Frankfurt am Main!). With online dating, a woman wouldn’t give her address to a stranger. But if you know someone in real life (through college, church, etc.) and already have some rapport and sense of who the person is (i.e. not a criminal, not already married, etc. ), it would be a lot more usual for the guy to pick up his date from her home.